Are we living in post-religious times? Despite all the attention on the Catholic church and the papacy since Pope Benedict's surprise resignation in February, many pews have been sitting empty across Canada for years. While it would be easy to speculate that Canada has entered some sort of post-religious existence, many who delve more deeply into issues of faith say: "Not so fast." Despite all the attention on the Catholic church and the papacy since Pope Benedict's surprise resignation in February, many pews have been sitting empty across Canada for years. Church bank balances have dwindled and for sale signs have popped up like mushrooms in front of the lovely local landmarks that had drawn families to services for generations. In the face of that recent history, and a widely held view that society in general has become more secular, it's easy to speculate that Canada has entered some sort of post-religious existence, certainly for some mainstream Christian faiths. But many who study issues of faith and spirituality in the country say, "Not so fast." Mary Hynes: What do you believe? While Canadians' church-going habits may have changed dramatically — and more and more people say they have "no religion" — some of those who look closely at such things don't see faith, or a belief in God or a universal spirit, evaporating completely. 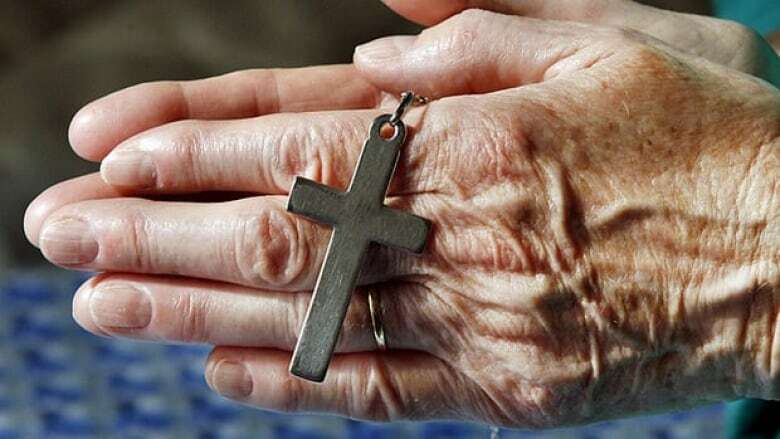 "Things are anything but over for religion in Canada," Reginald Bibby, a University of Lethbridge sociologist who has delved into the state of religion in Canada for four decades, wrote in a recent ebook. Instead, Bibby says in an interview, he sees a religious "polarization" in the country. "We have people who are inclined to embrace religion. We also have people who are inclined to simply reject it, with a fairly large number of people in the middle." Figures from Statistics Canada show that in 2010, about three in 10 Canadians went to a service at least monthly. A similar number attend less frequently. Four in 10 never go. Still, Bibby says, the reality is that religion is not going to go away. "For most people, the experience of life — as well as death — leads to questions of meaning, purpose and what happens when we die," Bibby writes. "In addition, some observers have maintained that there is almost an innate restlessness for something beyond ourselves." Research by the Environics Institute for Survey Research suggests a majority of Canadians are indeed looking for something beyond themselves, even if they don't go to a religious service to find it. According to Environics' Focus Canada 2011 project, 79 per cent of Canadians say they believe in God or a universal spirit. Seventeen per cent said they did not, and three per cent weren't quite sure. "People may be ready to walk away from the religion of their parents or grandparents, but they may not be ready to walk away from belief in a god or a higher power or something above and beyond themselves and humanity," says Keith Neuman, executive director for the Environics Institute for Survey Research. Environics hasn't delved into what that means, Neuman says, but he notes that "Canadians are much less religious in any kind of formal sense than people in many other parts of the world, and that includes the U.S." as well as "every other country in the Americas from Mexico on down." For those who see their faith as important, how it manifests itself seems to be evolving. "I think what you tend to see is that people have new forms of religious expression," says Robert Dennis, a teaching fellow in the Department of History at Queen's University in Kingston, Ont. Dennis, whose area of expertise is Roman Catholicism, figures that if the Canadian census asked a simple question like: "Are you religious?" a lot of Canadians would say no. But delve a little more deeply, and he expects the answer would be different. Ask if people are spiritual, if they have a particular kind of lifestyle and "probe the meaning of religion a little bit further and people still have these tendencies, they still have these commitments, they still have these values," says Dennis. "So in that sense, I wouldn't say that we're post-religious at all. I think what we see actually is more a restructuring of religion." For him, it's a privatizing of religion — not in an economic sense, but in the sense that it's not on such public display as it used to be. And it's a privatization that is unique to the individual. "I think if you surveyed university-age students, [they] would say, 'Well, I'm not religious, but I'm spiritual.' And you see forms of expression played out in things like doing yoga or having a commitment to being vegetarian or vegan," says Dennis. "These are not religious activities in the sense that they're denominational, that it's a denominational identity, but I think that a lot of the impetus for people doing some of those things actually fills the space that traditional religion has occupied in people's lives." Stuart Macdonald, a professor of church and society at Knox College at the University of Toronto, wouldn't say Canada's living in a post-religious time, but "post-Christendom, yes." He and colleague Brian Clarke have looked at the changing face of religion in Canada, and Macdonald says the dominance of Christianity over the culture has changed and will continue to change. He sees another "very significant" shift, this one in the number of Canadians who — via the census — say they have "no religion." That figure rose from less than one per cent in 1961 to four per cent in 1971. "But it didn't just stop at four per cent, and I think that's the thing that's fascinating. It has grown significantly every census since," says Macdonald. "It's over four million Canadians, so that's very significant. That's new for Canada." Macdonald sees 1971 as a key moment in that change, because it was the first time Canadians could mark their religion anonymously on the census, rather than giving an answer to a census taker in person. "I think there were social pressures for people to belong to churches. Growing up in that period, I certainly remember people seeming to feel that need to belong or to be seen to belong so they might not go all that often, but there seem to have been social pressures." Ask Macdonald what he thinks lies behind the changes Canada has seen, and his answer is quick: "The 1960s." The major cultural shift in that decade, and the reaction against all kinds of forms of authority, was profound. "We see that in all kinds of organizations, not just within religious organizations, so we see the abandonment of traditional lodges, the masons, service clubs not having the kind of members, changes in the young people's participation," says Macdonald. At first blush, suggestions that a majority of Canadians look to a God or a universal spirit could seem to be in contradiction to the steady downward spiral shown in other data on Canadians' religious habits. Macdonald, however, doesn't see a contradiction but rather a "new reality." "The phrase that sometimes people use is 'spiritual but not religious.' "
Bibby doesn't think Canada is living in post-religious times, and figures the "safest bet" is that "religion won't disappear at all in the world, certainly in Canada." The interesting question, he suggests, "is going to be the extent Canadians are going to be inclined to embrace religion versus to reject religion." "The real trick will be what the balance looks like over time."